This mouse line was made by RMCE in the Rosa26.LCA allele and exhibits yellow fluorescent protein (YFP, Citrine) expressed under control of the ROSA26 promoter. The YFP sequence is preceded by a translational enhancer and is followed by intron-containing rabbit b-globin polyA sequences. This mouse ubiquitously expresses YFP protein and can be used for transplantation and other experiments where tracing of source cells is required. This ES cell line contains a loxed cassette acceptor (LCA) allel in which a 5.17kb region of the gene has been replaced by a lox71 site, a puromycin-(delta)-thymidine kinase fusion gene driven by the mouse phosphoglycerol kinase promoter, a kanamycin resistance gene driven by the bacterial EM7 promoter, and a lox2272 site. These features enable use of Recombinase-Mediated Cassette Exchange (RMCE) for the rapid insertion of various DNAs into the Rosa26 gene locus. The pRosa.EN.YFP.bGsplicepA.Neo vector was made on a backbone of a basal exchange vector which contains a 4.081 kb sequence from the Rosa26 locus, Lox71/Lox2272 sites, and a flrted (flanked by FRT) Pgk-Neo cassette that is used for positive selection of ES cells after RMCE. 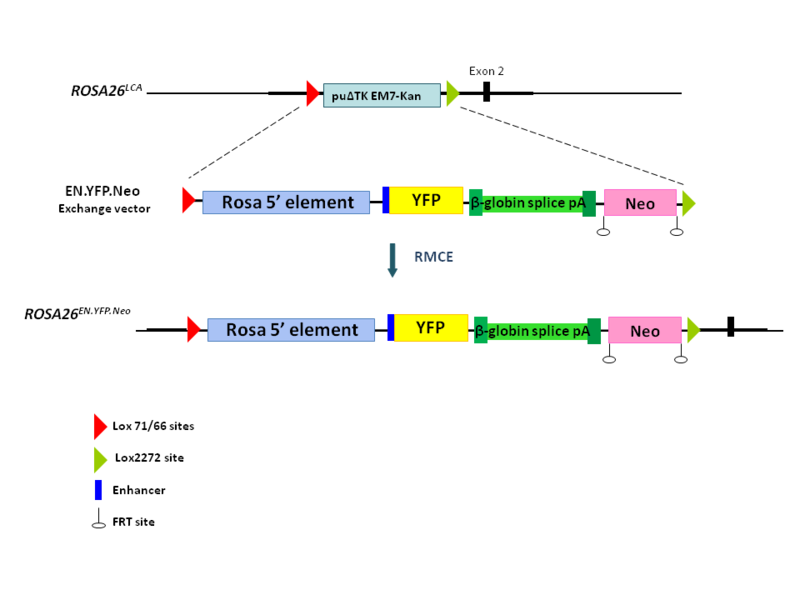 A 5' translational enhancer-YFP- intron-containing rabbit beta-globin polyA sequence was inserted (in place of Rosa26 exon 1), between the Lox71 and Pgk-Neo sites. After germline transmission, founder chimeras 129S6 were bred to C57Bl/6J mice for 3 generations.